Lacrosse is a team sport, so it’s fitting that we have not one but two respondents to Four Questions this week. 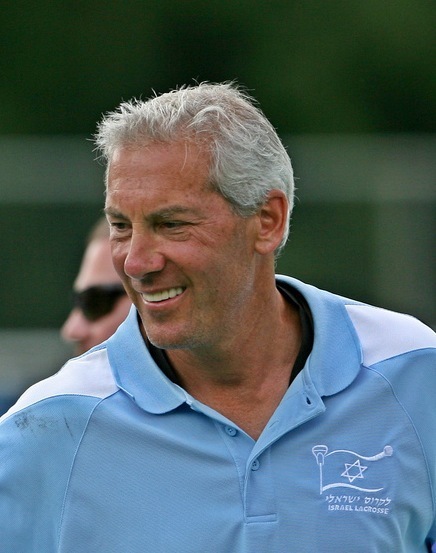 Coach Bill Beroza is leading the Israel men’s lacrosse team as it prepares for next year’s World Lacrosse Championship. Matt Caple is a Boston-area lacrosse player hoping to make that team. I asked them about the team and how such a North American sport made its way to Israel. So lacrosse is a North American sport, right? Coach Beroza: Lacrosse is a Native American sport and the fastest-growing sport on two feet in North America. It’s played in Division I, II and III men’s and women’s programs throughout the U.S. and Canada, and there are hundreds of club teams throughout the collegiate ranks as well. The men’s game is played in over 47 countries around the world, from powerhouses like the U.S., Canada, Australia, the Iroquois Nation and England, to many other nations like Ireland, Scotland, Japan, Israel, Turkey, France, Slovakia, Wales and Spain. And there are 19 women’s teams around the globe. How did lacrosse get to Israel, and what’s the state of the game there now? Coach Beroza: Scott Neiss, our executive director, came back from a Birthright Israel trip in early 2011 with a passion and vision for lacrosse in Israel. That spring he asked me if I’d be the coach for the Israel men’s team competing in the 2014 World Lacrosse Championship in Denver. This 25-year-old man convinced this 55-year-old man that his dream and vision were not only exciting, but doable. In the summer of 2012, we participated in the European Lacrosse Championships as Team Israel and came in eighth place out of 19 teams. We also entered their festival, which allowed us to enter both a women’s and men’s team for non-championship play, and I’m very proud to say that both our men and women won their respective tournaments and were named the champions. This summer we had two amazing events: our women’s team competed in the 2013 Women’s Lacrosse World Cup and finished eighth out of 19 countries, and we held tryouts for the men’s team that will be competing in the 2014 World Lacrosse Championship. We have a lot of work to do, but if you asked any of the 75-plus young men or some of the parents about each player’s or parent’s experience, I think you’d learn that each person learned something new about themselves, their family, their Jewish identity and much more. Coach, I understand you had a distinguished career as a player in the States. What brought you to Israel to coach? I played lacrosse on Long Island and graduated from Hempstead High School. 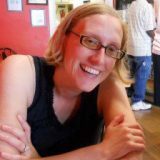 I then attended Roanoke College in Virginia and was a two-time All-American. I made the U.S. team as an alternate in both 1978 and 1986, and also had the fortune of being a goalie and a captain on the 1982 U.S. team, which won the gold medal after defeating Australia in the finals. I was then named an assistant coach for the men’s team in 1998, which defeated Canada to win another world championship at Johns Hopkins University, which was pretty special as I had played there 16 years earlier representing the U.S., and then had a chance to coach on the same field with some very talented coaches—Bill Tierney, Jeff Long and Paul Wehrum—and a boatload of talented players. 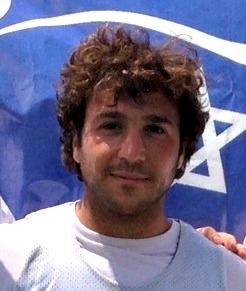 What brought me to Israel Lacrosse was a phone call from Scott Neiss. He knew about me and my background, and as a member of the Jewish Sports Hall of Fame on Long Island, he figured I’d be all in. He was right, and now we have so many other friends, players and a plethora of lacrosse fanatics who want to help, but we can also use more. Matt, you joined an Israeli team after going on Birthright. That must have been quite a trip to inspire you to stay! Tell me about it. Matt: I participated in a Birthright trip run by Young Judaea this past winter with my close childhood friend Mike Stone, a professional lacrosse player for the Boston Cannons, as well as my younger cousin, Colin Tofel. All three of us had bar mitzvahs but had lost touch with our Judaism during college, so we decided a 10-day educational vacation to Israel sounded like a great way to rediscover our faith and learn more about our collective history. Our tour guide did a fantastic job engaging the entire group, such that when our 10 days were over, the three of us decided to stay in Tel Aviv with another friend from the States, Ben Rudin, who played in the Elitzur Kiryat Ata basketball club before making aliyah, attending business school and building a life in Tel Aviv. I discussed with Ben the logistical obstacles to relocating from Boston to Israel. He encouraged me to visit Israel again to confirm my feelings for the country and then explore a path similar to his. Upon returning to Boston I immediately sought out Scott Neiss and Coach Beroza, as their mission with Israel Lacrosse combines two things I am passionate about. Following our initial conversations, it was clear that their hard work and dedication were going to make Israel Lacrosse a success, and that their team was one I wanted to be involved with. Having just returned from tryouts in Netanya, I can confirm that the 2014 team will be a success, as the 75 other lacrosse players were not only great players but great people! I heard that you’ve had to forfeit games because they were scheduled during Shabbat. Does that mean you’ll always have a losing record? Coach Beroza: We haven’t had to forfeit any games at this point in time, as many countries have respected our requests not to play after sundown on Friday evening or prior to sunset on Saturday evening. The European Lacrosse Union respected that request and accommodated us last year in Amsterdam, and we will continue to expect this type of support at the men’s championships in Denver. Our rationale for not playing on Shabbat is out of respect for the country we are playing for and representing. And in no way does it mean we’ll have a losing record; it means we need to work within the system and figure out a way to get games in when we play.